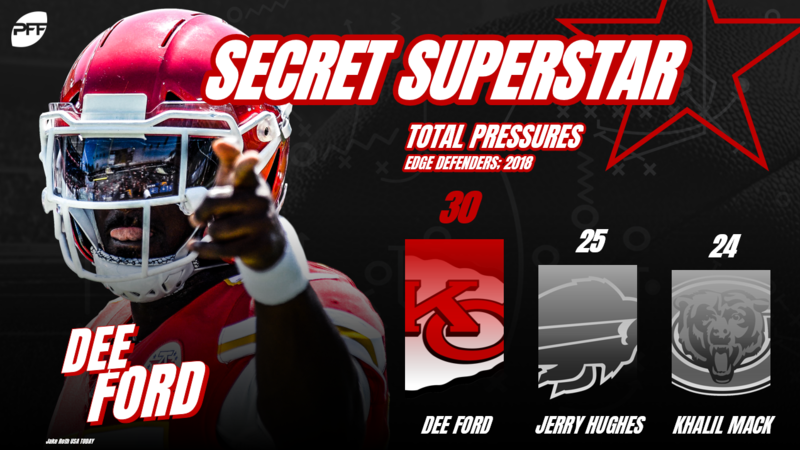 Secret Superstars is our weekly feature where we’ll be highlighting great play in the previous week’s games from under-the-radar players. While we’ll give most weight to performance in the week just gone, an out-of-the-blue game isn’t going to sway us too much. We are looking for some degree of confidence this wasn’t just a one-off thing, whether it be played in other games this year, in college, etc. On our SkySports segment for UK TV, during the Jacksonville-Kansas City game, I asked Sam Monson the question “so when did Dee Ford get good?” To which, the replay that came back was “just this year.” That I guess pretty much sums up Ford’s career to date. The 23rd overall pick out of Auburn in 2014 was set up for success: learning the trade behind Justin Houston and Tamba Hali and then gradually worked into the rotation as he developed. Unfortunately, that improvement never materialized – until now. 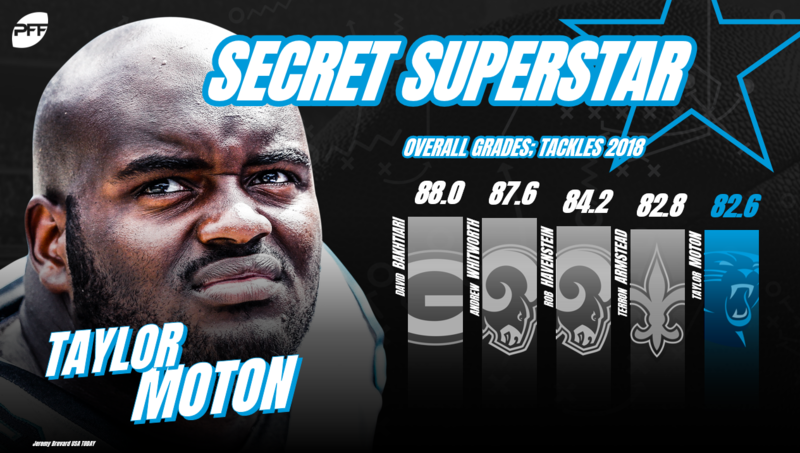 Moton may be a secret to many but not the PFF draft analysts who had him at No. 54 on our 2017 Draft Board and may even have had him higher if he hadn’t just played the one year at tackle (he’d been at right guard for Western Michigan through 2014 and 2015). Playing right tackle in his senior year, he gave up only nine pressures (no sacks) on 443 pass-blocks and graded as our sixth-best draft0eligible tackle. After playing only 63 snaps in 2017 for Carolina, Week 1 of this season saw him “thrown in” at left tackle where he did ‘OK.’ He’d only had 33 snaps at the position in preseason to acclimate himself and looked a little uncomfortable at times. However, in Week 2, he was moved back to right tackle and his performance took off. Over those weeks, he’s graded as our top tackle (regardless of position), giving up only two hurries and grading as the No. 4 overall run-blocker with a 79.6 rating. 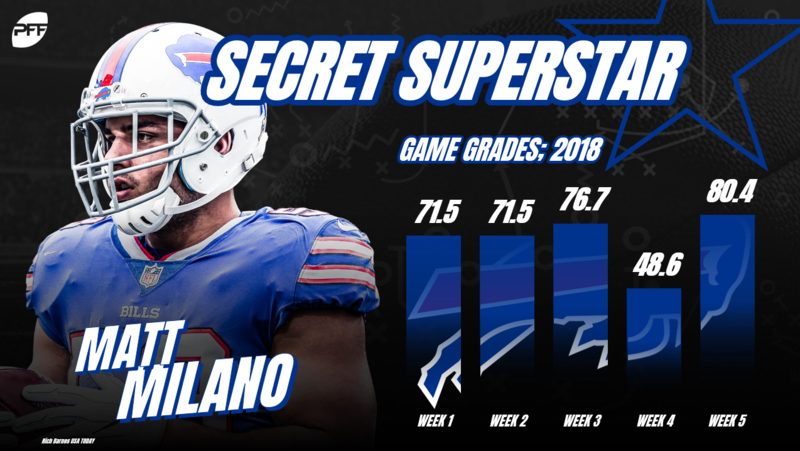 Milano became the starting weakside linebacker for the Bills in Week 14 last year after proving himself with some standout games, most notably his 87.8 graded showing in Week 7 against the Buccaneers where he had a couple of pressures, made two stops and picked up an interception in coverage. He finished the season with 450 snaps and an adequate 60.3 grade This wasn’t unreasonable production for a fifth-round pick with the ability to kick on as shown in his best game. Kick on, as it happens, is exactly what he’s done, turning his form around somewhat and making poor games as much an exception as good ones were last year. His only poor outing so far has come against the Packers (48.6 grade) and outside of that, he’s graded no lower than a 71.5. Some issues with tackling aside (eight missed tackles), he’s been solid in run defense, graded well in coverage, picked up four pressures blitzing and ranks as our 11th overall linebacker. He just needs to maintain this level of play and improve his tackling to become one of the more well-rounded linebackers in the game. 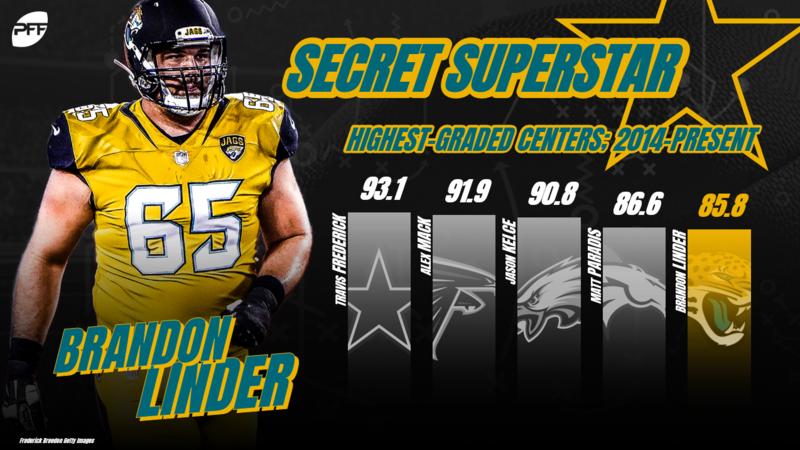 Since coming into the league in 2014, Linder has turned himself into one of the most consistent and best centers in football but somehow still flies under the radar. That’s somewhat remarkable for the second-highest paid center in the game but such is life as a player on the offensive line of a team with one of the best defenses in football. With that many stars, the media doesn’t need to hype the center right? Since he came into the league, his 85.8 grade ranks him as the fifth-best player at his position in the game and his consistency is remarkable. His injury-hit 2015 season aside, he’s never graded lower than 75.8 in any individual year and he currently is ranked as our fourth overall center. It’s kind of hard for a 10-year veteran to be a secret but after a number of good years with the Titans, by whom he was drafted in 2009, his play started to fall away and it looked like he might be drifting towards retirement. In May 2017, he signed with Cleveland and actually played very well for the winless Browns grading a highly creditable 76.3. His swan-song? Well, so many may have believed but he was signed by his brother’s Patriots and so far this year, is having one of the best seasons of his career. His 62.3 passer rating when targeted is tied for the 12th-best among cornerbacks and his 80.5 grade is third. 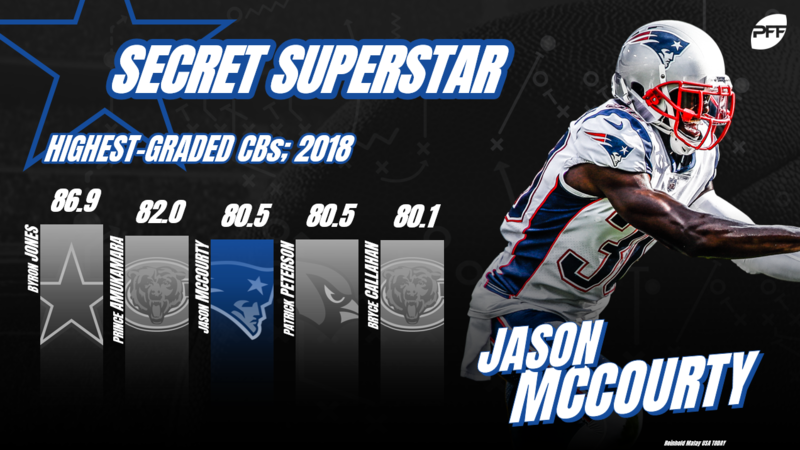 He’s turning a good secondary for the Patriots into a potentially excellent one and maybe his best play is yet to come.